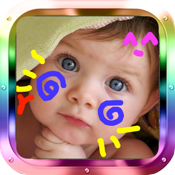 Create your drawing ability, because you can DIY your photos or any pics from your photo Library. It's really cool and Fun!Moreover,kids will also love to try that. and best wishes.Very interesting and Fun. Inspire Your drawing potential,fall in love to this way of drawing.Draw my Photos, Easy and Funny!! !